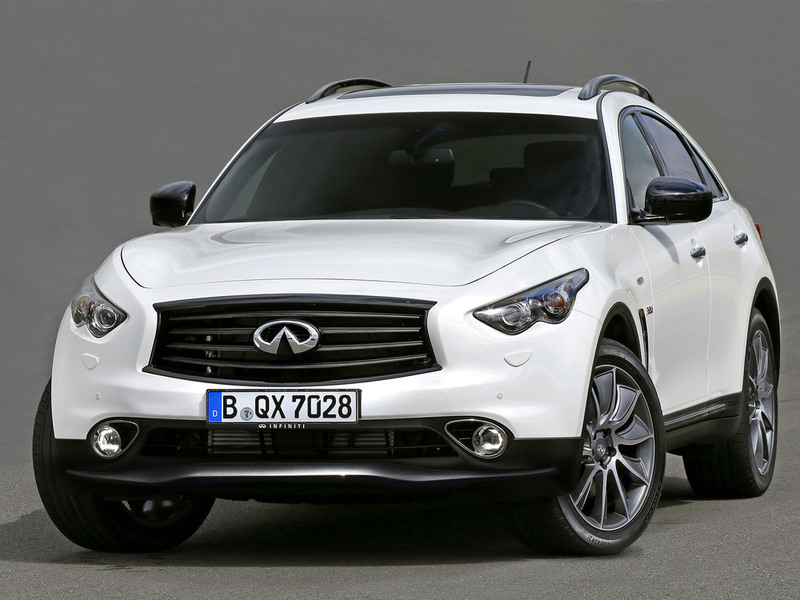 Infiniti has unveiled a new 'Ultimate' version of its QX70. The latest version of Infiniti's SUV adopts 'the best features, technologies and craftsmanship of QX70' while subtle front and rear design changes, including a new front splitter and rear diffuser with integrated fog light are new for the Ultimate model. New dark chrome trim front and rear joins new 21-inch anthracite alloy wheels, while new daytime running lights give it 'even more road presence'. The car's interior is finished in shiny black lacquer, with purple stitching, soft leather - whilst maintaining the 'room, luxury and convenience' for which the QX70 is already famous, according to Infiniti. For the Ultimate version, two high performance engines are fitted: either a potent 3.7-litre V6 petrol engine or a refined and torquey 3.0-litre V6 diesel. Both are mated to a 7-speed adaptive shift automatic transmission with gearshift paddles on the steering wheel. With 'sports car-like weight distribution' and an intelligent torque-sensing all-wheel drive system, Infiniti says the Ultimate delivers agility and response however demanding the roads. On sale in UK after it debuts at the Frankfurt Motor Show on September 15 2015, prices for the Infiniti QX70 Ultimate start at £52,430 OTR for the petrol version and £52,280 OTR for the diesel version.